A ding circular porcelain dish, supported on a small ring foot, the thinly potted sides flaring out towards the rim and terminating in a lipped edge. The interior of the dish is carved with a bold design of a daylily amongst scrolling foliage. The centre of the dish is engraved with a circle, which does not completely contain the decoration. The exterior of the dish is plain. The porcelain body is covered in an evenly applied, glossy ivory-coloured glaze, leaving just the outer rim and part of the foot unglazed, where it shows the white porcelain body. Daylilies (xuancao in Chinese) gained their name for flowering only for one day and are indigenous to Asia where they were originally raised as a food crop; the buds are harvested and eaten, the flowers are used in soups as flavouring, the leaves provide a salad ingredient and the small white tubers in the roots are eaten in a similar way as water chestnuts. 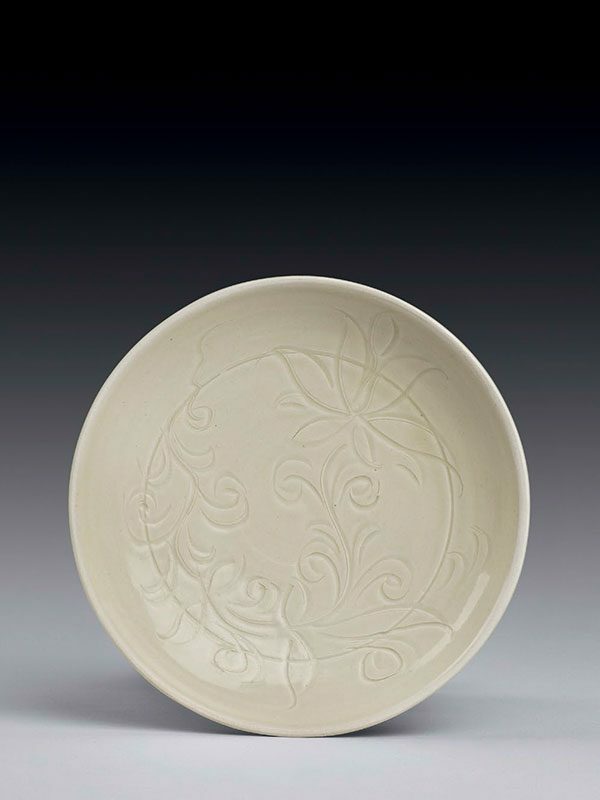 The freely drawn decoration of the daylily on the present dish serves not merely as a decorative device but also has various auspicious meanings; it is known in China as wangyoucao, the ‘plant that dispels grief’; yinancao, ‘boy-favouring herb’, where it expresses a wish for male offspring; or it symbolises children’s love towards their mothers. The boldly carved decorations often featured on ding porcelains are a Song innovation, and they mostly have an almost painterly quality. In carving the design, the potter appears to have ignored the central ring that was first carved into the dish. Delicate ding porcelains with dense, high-fired bodies and strong glazes are the precursors of true porcelain. Dishes such as the present example were fired upside-down in the kiln, necessitating the rims to be wiped clean of glaze before firing, to prevent them from becoming stuck to the kiln floor. The resulting unglazed rims of dishes and bowls are brittle, and were therefore often bound in thin strips of metal. 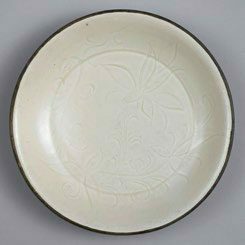 A closely comparable ding dish carved with daylily, similar in size and shape, is in the collection of the Palace Museum, Beijing (fig. 1). 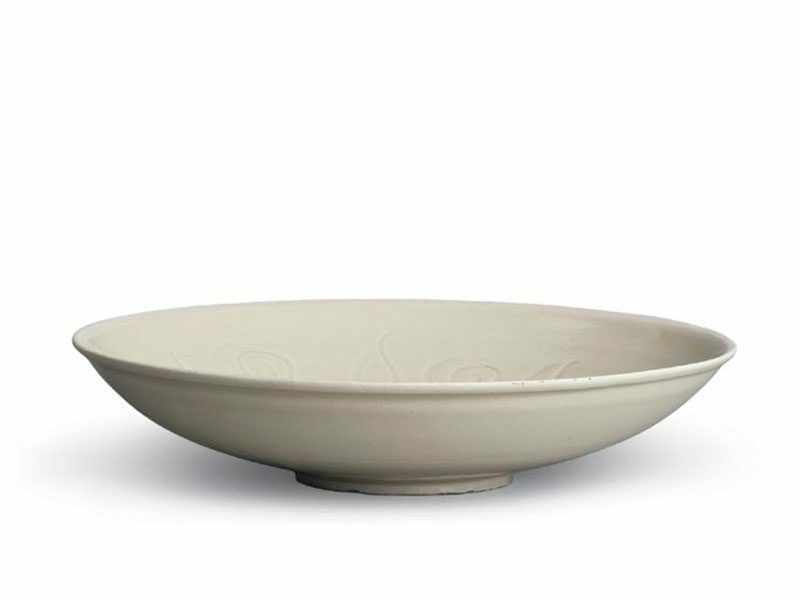 A smaller ding dish with a daylily, contained within a central circle, is in the collection of Robin and R. Randolph Richmond, Jr. A white stoneware deep bowl with similar carved decoration of daylilies is in the collection of Kai-Yin Lo.